Parents, if you’re looking for a fun way to kick off summer with your kids, join your Z family for Healthy Kids Day at the Oviedo YMCA. Your friend Ellis from Z88.3 Mornings will be there on Saturday, April 21 from 10 a.m. to 1 p.m. and all the activities are free! You don’t have to be a member to join the fun. From crafts and activities, to fun work out classes and splash time in the pool, your friend Ellis will be there to help your family have a good time- not to mention the games and yummy snacks that’ll be there, too. 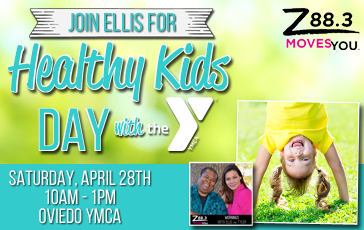 If you can’t join Ellis in Oviedo, there are fun activities happening at every YMCA in Central Florida to celebrate Healthy Kids Day. All the activities are free and it’s a great way to meet your neighbors and get to know your neighborhood Y. You can pre-register and find locations near you on YMCA Central Florida’s site. Ellis is looking forward to spending the morning with your family on Saturday, April 21! To learn more about Healthy Kids Day in Oviedo, please visit the Oviedo YMCA event page.